positioned the Actinic within a clearing in the wood. The weather was pretty much perfect, though a little cooler than our previous trip here, the sky did clear slightly and the temperature on my was home did dip to 9c. The moths were quick to respond and we were netting lots as they were coming in. The species were mainly singletons albeit apart from several species such as Grey Pug, Heart & Dart, Light Emerald, Common Marbled Carpet, Common Carpet and Mottled Beauty. Shears was nice to see in good numbers aswell. 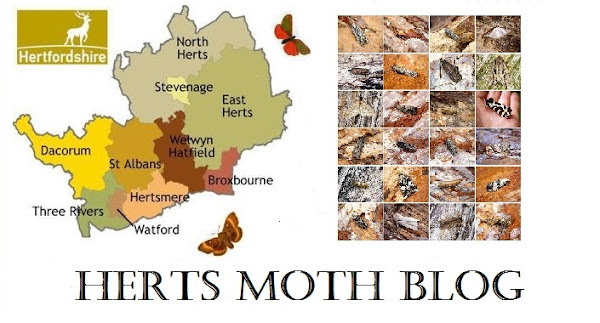 Best Macro moths were probably Coronet and Haworth's Pug, the former becoming a regular nowadays in the West of Hertfordshire. Gadesprings did not fair so good again when we checked the traps at 2am with very little in any of them, but we did get a Miller which was nice. The suspected Triple-spotted Clay, after checking the underneath of the forewings turned out to be a Double Square-spot. The Caloptilia was indeed syringella. Roger did a good spot for the Haworth's Pug. Numbers of species are approximate.